Do you have a young teen in your house? Would they love to earn a $10 Amazon gift card or more?? 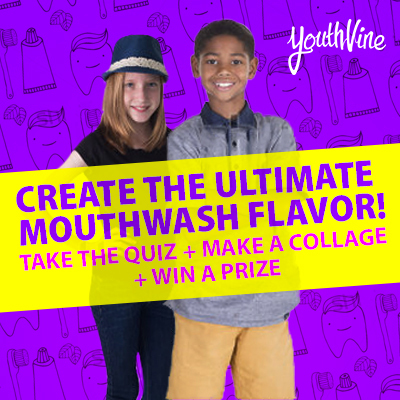 Over the last few weeks, my daughter has been participating in a fun survey from Youthvine. The online community of tweens and teens works with brands to help the latter better understand what kids want. This particular survey is just what my daughter loves: an opportunity to share her opinion and how she thinks a company can improve their products based on her likes and dislikes. It's all about mouthwash flavors. And she certainly has an opinion on this because, unfortunately, we spend a LOT of time at the dentist and she has to devote extra attention to her daily oral care routine. Forty kids will go on to be selected to create a collage for an extra $10 Amazon gift card. This was super fun for my daughter because she chose to use an online collage builder for her project. But kids can draw or cut and paste theirs if they prefer and just upload a picture. My child is not contacted directly by the research company. She used the online survey to answer her questions and then she uploaded her completed collage. I was able to supervise the entire process. I knew what was going on the whole time and am their point of contact. They are specifically looking for young teens, so if you have one in your family and would like to have him or her take the survey, click here. Disclosure: This is a sponsored post. All opinions are strictly my own.